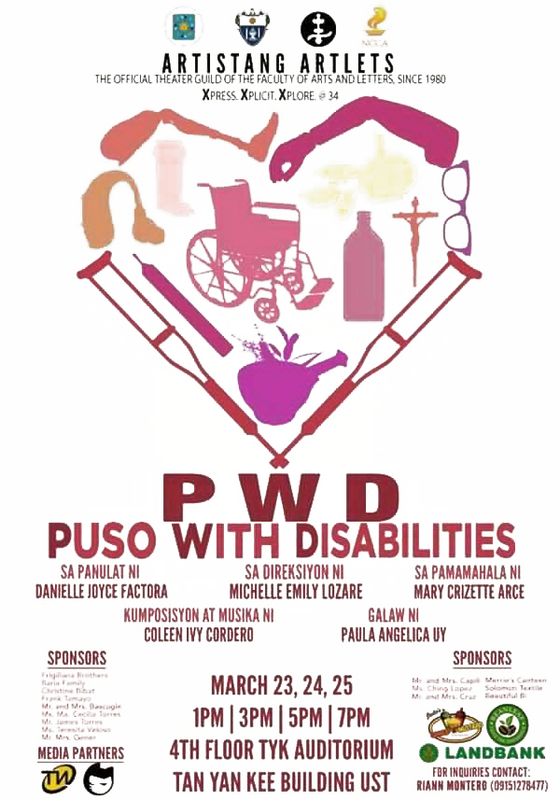 Artistang Artlets, the official theatre guild of the University of Santo Tomas’ Faculy of Arts and Letters, presents “PWD (Puso With Disabilities)” written by Danielle Joyce Factora, directed by Michelle Emily Lozare and produced by Mary Crizette Arce. PWD (Puso With Disabilities) is a musical about the lapses that occur in relationships that lead to conflicts that hinder someone from choosing to love again. This production aims show remedies to various problems one may experience in love and how people involved in a relationship can use these remedies to come up with a compromise. PWD (Puso With Disabilities) will run at the Tan Yan Kee Student Center AVR on the following play dates: March 23, 24 and 25 at the time 1pm, 3pm, 5pm and 7pm. For tickets and information please contact Jann Kayla Mendoza (09278423870) or John Michael Peña (09058245399).